We want to say how much we appreciate all of you who like us and our music! 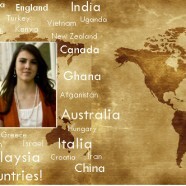 Â Â We have been surprised at how many of you are from places all over the world! Â Â That is so cool to us, especially because we love people from all different countries and cultures and languages. Â Â Maybe because our mom and dad are from different countries … it could also be because our Dad had a language business for many years and we grew up learning words and interesting insights of people from other countries and languages. Â Â But whatever the reason, we really love people like you from all over the world!